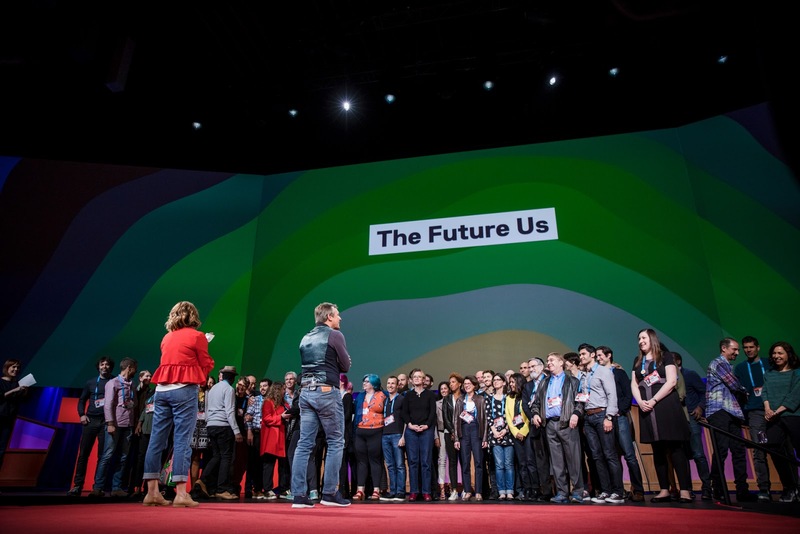 The final day of TED 2017 consisted of a single long session and it was a good one. It has been an amazing week, but my head is full of ideas and thoughts and I'm exhausted. I'm looking forward to being home. Before getting to Friday, there is one thing I didn't mention from Thursday. The day started off for me by attending a Christian prayer breakfast. It was great to get to talk with 30 or so other Christian TED attendees including several speakers. I felt very humbled to hear from many of the folks about the things they were doing such as working inner city gang members, arranging for organ donations, and leading large churches in unlikely places like Hollywood Boulevard in LA. It was good to have the opportunity to spend time with these folks and pray with them. The day on Friday started with a new experiment of letting some of the attendees come on stage and give feedback. They asked people during the week to send their thoughts if they wanted to speak. The TED staff choose about 15 people limited each to a minute. One attendee felt that the questions asked of Serena Williams were a missed opportunity. She noted that one of the greatest athletes of all time was on the stage and most of questions were about her pregnancy, wedding plans, and the like. The woman asked if a man would have been asked the same questions. Another attendee argued that red/blue diversity is severely limited at TED. He cited one of the talks which was a pure attack on Trump comparing him to a devil in a painting and would not have been tolerated about a blue politician. The questioner caused me to think about the week. This year did have more mentions of God than in the past. After all, they had a rabbi, the Pope, and someone who prayed to started their talk. At the same, TED showed a video from Steven Colbert about what it might be like if Jesus spoke at TED. They certainly didn't do that about atheists or Muslims or any other group. There is a double standard of what is fair game and what is not. 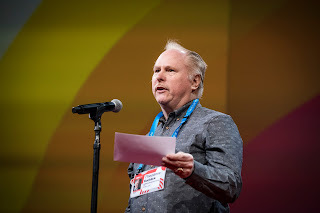 If the TED organizers have the feedback session again next year, I need to attempt to say something about my thoughts on that issue. The first talk was a late addition by Tristan Harris which was one of the most thought provoking of the day. Harris was a former design ethicist at Google and earlier was at the Stanford Persuasive Technology Lab. He told about the groups of people whose jobs are to get the attention of over one billion people around the world. He mentioned the oft quoted recent line by the head of Netflix that their biggest competitors were Facebook, YouTube, and sleep. Talked about how app notifications schedule little bits of our time. Getting our attention is the key and outrage draws attention better. He said that content is precisely targeted at the most susceptible people. The attention economy is a race to the bottom, seeing who can go lower, faster. He stated that the Internet is not evolving at random. Instead it is the intentional action of the Facebooks of the world to get our attention. He gave the example of how Snapchat gamified their friend connections. They keep track of the streak of how many days in a row you've chatted with each friend. To keep the streak alive, users reorder their lives. Kids give their password to friends to maintain the streak if they can't get to a phone. He thinks that persuasion should only be in the direction people want to be persuaded. I found this very troubling. The problem is who decides what direction people should be persuaded. I'm not claiming we are being persuaded in a good way now, but I'm not sure we can find agreement on how we should be persuaded. He believes that we need to first acknowledge that we are susceptible, implement new accountability models, and foster a design renaissance to avoid many of these issues.. The first is definitely true. The second sounds like a good idea, but I have no reason to believe it will happen. The final one I am very skeptical will happen. The talk began with a standard joke about Musk's new company for boring tunnels under cities to alleviate traffic congestion. Musk made a plausible case for how he can reduce the costs and make it work. He also noted that there are dangers with flying car. Should you worry if a loose hub cap will fall and decapitate you? He stated that Model 3 was still on schedule for July manufacturing start. I wonder when they’ll get to my reservation? 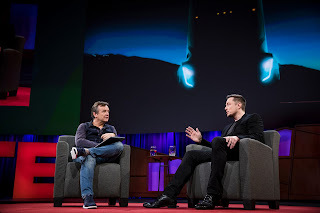 He said that he expects a Tesla to make a journey from LA to NYC fully autonomously by the end of 2017. Musk showed a picture of an electric semi truck. He claimed it would have more torque than a diesel engine and in a tug of war could pull a diesel up hill. Musk figured that we will need about 100 gigafactories to meet the world’s battery demand. and plans to announce two to four more later this year around the world. 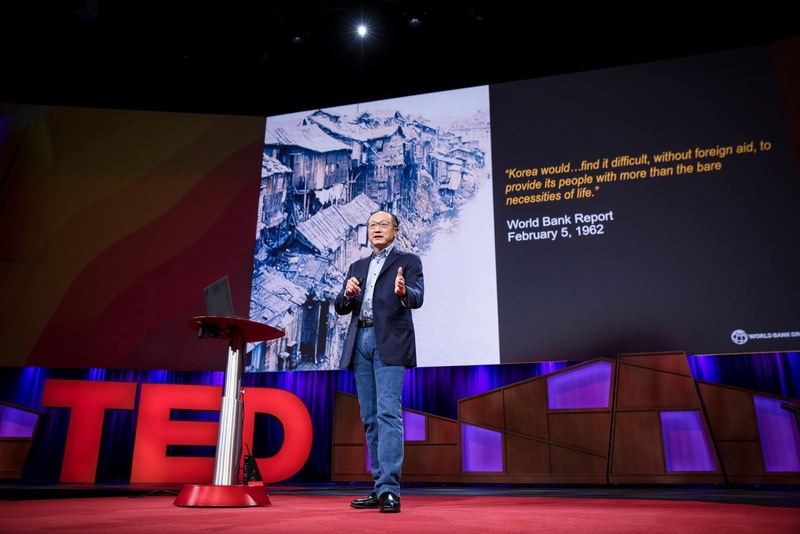 Jim Yong Kim, president of the World Bank spoke. I assumed it would be a boring technical talk about interest rates or such. Instead, it was an inspiring and hopeful talk. He started by talking about how smartphones are raising the aspirations of people around the world faster than their incomes. The internet increases satisfaction and reference income. He explained that when he was a small child in South Korea, it was one of the poorest countries in the world. By spending time in the US, his father's aspirations were raised and he eventually emmigrated to the US with his young family. Kim told of his work with Paul Farmer in forming Partners in Health. (Tracy Kidder's book on Paul Farmer, Mountains beyond Mountains, is one that inspired me to want to do something more with my life.) Kim often ran into arguments with the World Bank while doing that work. Since 2012 he has been the head of the World Bank and is working to make it more supportive of the world's poorest. Kim told of some troubling trends like the possibility that two thirds of all jobs in developing nations could be lost to automation. That coupled with the stunted development of children's brains in those countries (such as 38% of the children in India) will make the necessary retraining difficult. His answer is to get money that is doing little to invest in those countries. He noted that almost half of the world's wealth is invested in low-interest loans, negative-interest loans, or conceptual mattresses. The World Bank is trying to utilize that capital by de-risking loans that help the poorest people. They are working with projects such as solar power financing and drones in Rwanda that deliver blood to remote locations. Both are money makers, given the necessary financing. World Bank de-risks the financial by pledge to take the initial losses (if there are any) which qualifies the loans to be of investment grade. It was quite exciting to hear someone in a person of real influence using that influence to make real progress in the world. The author Anne Lamott gave a delightful talk about the things she knows to be true. Mostly. These things ranged from all truth is a paradox to chocolate with 75% cacao is not food to almost everything will work again if you unplug it for a few minutes (including you). She had many quotable lines and great comedic timing. The talk was at times serious, funny, touching, and insightful. Sometimes she managed to be all of those at the same time. The talk, however, was one thatmy attempt to write about will most certainly fail. Watch for it to come out as a TED video and enjoy it. Noah Feldman is a constitutional law scholar. He talked about strong parallels between today and a time early in American history. James Madison had been the main architect and implementer of the Constitution. At that time politics where very partisan (Republicans, led by Madison versus Federalists, led by Hamilton). The country was divided between the traders in coastal cities who wanted to look outward and the agrarian land owners away from the coasts that wanted to look inward. The problems seemed intractable. There are obvious similarities to today. His conclusion is that our Constitution provides the necessary mechanisms to resolve the issues. 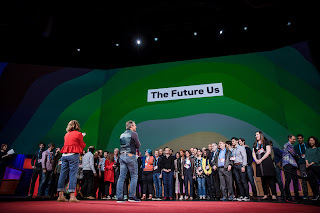 The TED staff gathered all of the speakers in the audience onto the stage. It was quite impressive to see how many of them were still in attendance. Another party followed the session. I made a point of telling both Chris Anderson and Kelly Stoetzel that they had done a great job and that it was probably the best TED that I had attended. So, what are my conclusions and takeaways fro the week? Though I had no where near as many conversations about Limit Your Greed as I had hoped, all the ones I had convinced me that trying to get that message out and get the book published are more important than ever. I also came away convinced that I need to put in place some rules on my screen usage such as limiting my usage at meals and remove most (or all) of my notifications. Pretty much everything can wait a few minutes. I also plan to start studying Chinese, whether that is because of my trips to China or to lessen my odds of Alzheimer's is beside the point! Thanks to those of you that read these blog entries. My final takeaway is that I need to get back to writing them more regularly. I enjoyed reading this. Very interesting!